A Utah television station is refusing to air an anti-war ad featuring Cindy Sheehan, whose son's death in Iraq prompted a vigil outside President George W. Bush's Texas ranch. Also, a patriotic camp with a "God Bless Our President!" banner sprung up in downtown Crawford, Texas Saturday, countering the anti-war demonstration started by Sheehan. The camp is named "Fort Qualls," in memory of Marine Lance Cpl. Louis Wayne Qualls, 20, who died in Iraq last fall. In the ad, Sheehan pleads with Bush for a meeting and accuses him of lying to the American people about Iraq's development of weapons of mass destruction and its connection to al Qaeda. "I love my country. 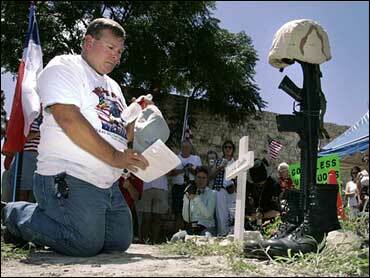 But how many more of our loved ones need to die in this senseless war?" a weary-looking Sheehan asks in the ad. "I know you can't bring Casey back. But it's time to admit mistakes and bring our troops home now." The ads were bought by Gold Star Families for Peace, co-founded by Sheehan. Salt Lake City affiliates of NBC, CBS and Fox began running the ad Saturday. Celeste Zappala, who with Sheehan co-founded Gold Star Families for Peace, said she was puzzled by the decision. "What stunned me was that it was inappropriate to hear this message," she said. "How is it that Salt Lake City should hear no questions about the war?" The e-mail read: "The viewpoints reflected in the spot are incompatible with our marketplace and will not be well received by our viewers." It added that the spot didn't qualify as an issue advertisement. For the ad to have been considered an "issue" advertisement a ballot measure would have had to be at stake, D'Antuono said. Mark Wiest, vice president of sales for NBC-affiliated KSL television, said that in the interest of freedom of speech, his station didn't hesitate to run the ad. KSL is owned by The Church of Jesus Christ of Latter-day Saints. "The bigger picture is, by suppressing the message are we doing what is right under the First Amendment and in an open democratic society?" Wiest said. Salt Lake City's Mayor Rocky Anderson used e-mail this week to call for "the biggest demonstration this state has ever seen," when President Bush appears at the convention Monday. Anderson says Bush policies are disastrous for the country and that to stay quiet during the president's visit would be send a message of apathy. The mayor's e-mail called for a collaboration of health care advocates, seniors, gay and lesbian advocates, anti-Patriot advocates, civil libertarians and anti-war folks to protest outside the VFW convention. Mike Parkin, senior vice commander of a VFW post in Salt Lake City, says the move makes Anderson look unpatriotic. The Vietnam vet, who says he voted for Anderson, but won't again, says the protest will offend veterans and embolden enemies of the U.S. In Crawford, Gary Qualls, the father of a slain soldier, explained his reasons for supporting the pro-war camp. "If I have to sacrifice my whole family for the sake of our country and world, other countries that want freedom, I'll do that," said Qualls, who is friends with the local business owner who started the camp. He said his 16-year-old son now wants to enlist, and he supports that decision. Qualls called the protesters' views disrespectful to soldiers, and said he had to yank out two more crosses after protesters kept replacing them.